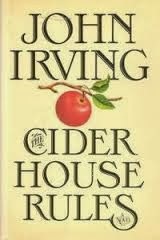 John Irving is in a way a quintessential American author: A writer whose stories capture the goodness of the human heart, the boundaries of compassion, the simplicity of life and moral values that surround it; all woven into a wonderful tapestry of a good story told well. Reading him is a pleasure, in that it evokes a lot of visual imagery of exotic New England. His language and dialogues have an elegant prose style that makes the characters speak the most intimate thoughts in a matter of fact manner. Sometimes he reminds me of Henry James (my favorite writer), that great American novelist, who had this subliminal ability to sketch a character with great artistry and finesse. Many years ago when I read “The world according to Garp”, it was almost with a very heavy heart that I remember putting the book down. The psychological crevices that John explored in Garp’s life, his sensitive treatment of unrequited love and its aftermath; and the recompense that can found in adultery; were handled beautifully without ever turning into vulgarity. A Wonderful work of fiction with hidden motifs. Well, a couple of weeks ago, I picked up his “The Cider house rules” from the local library, and found myself completing it in a couple of days. The story of an orphan who pines to live the life in the world outside his shelter, gets a taste of it; only to return back to his orphanage convinced that the life of duplicity out there is not for him and dedicates himself to the well-being of the children in it. Of course, I have condensed an intricate many layered story in a few lines above. Soon after I read it, I chanced to see the movie based on the book. The screenplay was written by John Irving and the lead roles were played by Toby McGuire, Michael Caine and Charlize Theron (I have begun to admire this beautiful actor). Oh!! What a treat to the senses. In the lush setting of Maine, New England, amidst the proliferation of rioting colors, the steady flow of the Piscataqua River lapping its bays, the fruit laden Cider trees: Lasse Hallström has recreated the magic of the book on screen. Michael Caine, as the adoring doctor with an impeccable Bostonian accent, Homer wells (Toby) as the orphan and Charlize as girl who needs to fill emptiness with companionship carefully etch out the characters that fills the pages of Irving’s book. Every frame is a connoisseur’s delight. Since I had already read the book, I could see the craftsman in Irving chiseling put the redundant parts of his novel and injecting just the right dose of emotion, intellectualism, romance and moral vacillation in his screenplay. The original background score by the talented Rachel Portman embellishes each scene with fine flute and cello variations, that rise and flow with the sway of the Cider trees or the curdling emotions of its characters. One could hear the mellowed strains of the great English composer Ralph Vaughn Williams in her composition, which she learnt as a child in Charterhouse school in Surrey. The accolades however go to Michael Caine, for his formidable performance as a doctor whose heart is in the right place. He won his second academy award as the best supporting actor for this role. Deservingly so….